The buzz surrounding quinoa (pronounced KEEN-wah) doesn’t seem to be slowing down. Quinoa has been hailed a superfood and for good reason, too. Its high protein and fiber content, along with being gluten-free, has given it quite the star power. quinoa. Given the rise of food sensitivities, quinoa delivers here, too; it’s gluten and wheat-free so it is safe to consume for many people. Quinoa deserves its superfood status; quinoa is packed with essential nutrients. Here are some of quinoa nutrition facts to show how great this grain really is. For starters, quinoa ranks low on the glycemic index (GI) which means it won’t cause spikes in glucose levels, making it a healthy option for diabetics and those watching their sugar. A quarter cup of dry quinoa contains 160 calories, 6 grams of protein, 227 grams of carbohydrates, zero grams of cholesterol and sodium, 2.5 grams of fat and 3 grams of fiber. As you can see, with only a small portion of quinoa you not only get the essentials but you won’t get the unnecessary sugar, salt and cholesterol. Quinoa a safe food for just about any diet. Furthermore, quinoa’s vitamin and mineral content supplies vitamin E, iron, manganese, copper, folate, zinc, potassium, phosphorus, essential amino acids and magnesium. Basically, quinoa supplies you with so many essentials your body needs to function. 1 High in protein: Your body needs protein, this much we know. Especially if you’re a vegetarian, quinoa is a good alternative to still get in your intake. Protein is used to build and repair muscles, even more essential for seniors as they may not be as active. Helping to maintain muscle mass with healthy eating is ideal. 2 High in fiber: Fiber is essential for digestion. Not enough of it and you’ll suffer from constipation which is harmful to health. Insoluble fiber, the kind your body can’t break down – which is found in quinoa – can also help us feel fuller longer, making it a useful food for weight loss and weight management. Just remember, though, for fiber to be effective it must be consumed with a lot of water or else you can still find yourself backed up with constipation. 3 Antioxidant power: Antioxidants are useful to the body to help fight against free-radical damage. Quinoa offers antioxidants called flavonoids which have been shown to reduce the risk of disease. 4 Low GI score: As we mentioned, quinoa has a low GI score. A GI score is calculated by a food’s ability to raise blood sugar levels. Foods with a low GI score are absorbed and digested slowly, so you avoid those spikes in blood sugar. 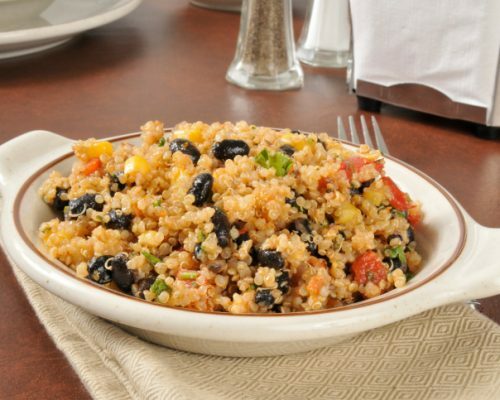 Because quinoa ranks low when it comes to GI, it is safe for diabetics to consume and to prevent diabetes. 5 Helps cholesterol: A study published in the American Journal of Clinical Nutrition observed the effects of whole grains on lowering cholesterol. Patients were on cholesterol-lowering medications and those who consumed at least 16 grams of whole grains like quinoa a day had a drop in non-HDL cholesterol as opposed who didn’t consume them. 6 Keeps your heart healthy: Because quinoa can help cholesterol, in turn, this can lead to a healthy heart. Quinoa also offers heart healthy fats and lowers fatty-acid levels which Italian researchers have found to reduce the risk of heart disease. 7 Provides essential minerals: Quinoa contains many essential minerals that we tend to lack if we consume a typical American diet. For example, 100 grams of quinoa (dry, before cooking) contains 30 percent of your Recommended Daily Allowance of magnesium which is essential for good health and reducing leg cramping. By soaking and cooking quinoa, you can achieve the maximum absorption of these minerals. Now that you know all the great benefits quinoa can offer your health, incorporating it into your diet is easy. Whether enjoyed on its own or with other foods, these quinoa recipes will help you make the most of this superfood. Because of its versatility, quinoa can be added and made into just about anything. From main dishes to desserts, quinoa has a place in just about every meal. Try some of these delicious quinoa recipes and watch your health blossom. Place a large pot over medium heat and add the olive oil. Add the onion, celery, carrots and thyme and cook until the vegetables are soft. Stir in the dry quinoa and add the broth with the 3 cups of water and salt and pepper to taste. Bring to a simmer and reduce the heat. Cover and cook for 12 to 15 minutes, until the quinoa begins to soften. Add the chicken and warm through for another 5 to 7 minutes. Season and ladle into bowls. Serves 4. Place a large pot over medium heat and coat the bottom with olive oil. Add the onion and garlic and sauté until softened. Add the chili powder, cumin, paprika, cayenne and quinoa. Top with the vegetable broth and bring to a simmer. Cook for 10 minutes. Add the beans, cocoa powder, nutritional yeast, salt and pepper. Bring the mixture to a boil and then simmer for another 20 to 30 minutes until it has thickened. Stir occasionally to prevent sticking to the bottom of the pan. Preheat the oven to 375 degrees Fahrenheit. Bring the water to a boil in a medium pot and add the quinoa. Reduce the heat and simmer the quinoa until it is soft and the rings appear clear around an opaque center, about 12 minutes. The water should be fully absorbed. In another pan, sauté the onion and red pepper in olive oil until softened and stir into the cooked quinoa. Dip the salmon into the beaten egg and then coat with the quinoa mixture. Place on a baking sheet coated with olive oil and bake for 15 to 20 minutes, or until fish is cooked through. Serves 4. There’s good reasoning behind calling quinoa a superfood. Quinoa health benefits reveal that it can provide you with great basics to a healthy life and body. Not only nutritious, it’s safe for everyone to consume. We’re a tired population. Most days it would seem that getting out of bed is a job in itself. But where has all the energy gone? Between work, caring for our families and other obligations life throws our way, the best time of the day, often times, is finally returning back to bed. You were always told to drink your milk and have bread and butter with every meal. But what if the very food you’ve eaten for years and years was actually the cause of your health issues? And how would you know for sure?